Purpose of a product? Serve customer needs! Recently I shared my thoughts on what should come first, your customer or your employees in a small post called ‘Customers First or employees first?’. Now I’d like to revisit this topic, because Steve Denning wrote a quite brilliant, comprehensive article about this topic. In this article I will apply Steve’s arguments to Products instead of firms. The term Product should be taken to refer to a solution that addresses a customer need. There seems to be a large group of business people that believe the purpose of a product (firm/company/organization) is to make money, aka to sustain itself. I’ve always had a bit of trouble with this notion but accepted it because when it doesn’t sustain itself it will go under. So it is pretty fundamental, we probably all agree on that bit. The main purpose of a company/product/organization is to create customers. What does this mean? Find a solution that serves a real need. The solution can be a physical product, a software product, or a service. But make sure it addresses a need! When you’ve found a solution that serves a real need find the right customer for this solution. For most solutions this means following a feedback loop that goes round a few times between potential solution and target customer before you get a nice match, aka every startup’s struggle for product-market fit). 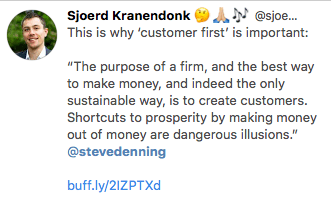 When you have – as Steve Denning puts it – ‘created a customer‘, it is time to get the ‘firm’ or business in order. This is where your potential employees come in. Creating a customer can be as bold as the need Apple created for tablets, by introducing their first iPad. To sustain a complex solution you often work with a group of people, probably but not necessarily an Agile Team of sorts. This means you now have employees. When you make sure all employees are thoroughly aware of the true purpose, the customer need we are seeking to serve, then there will be no trouble prioritizing customer needs over employee needs. They will flow from and with each other. The same goes for the ‘sustaining’ the product. We can only keep on addressing the customer need when we make enough money to keep at it. At least, when we want to keep playing a role in actively improving and keeping up with the changing needs of the customer. Does this content help? Let me know! See improvements? Let me know! Anything else you’d like to share/react to? Please do!